The basic product concept is of a healthy and energetic pet. The product consists of a sweet potato base supplemented with a balanced formulation of domestically produced beet, a classic functional vegetable with high nutrient value, and L-arginine. It is made with coconut oil, which has zero trans fatty acids, and contains none of the seven major allergens (wheat, milk and eggs) making it perfectly safe for pets with food allergies. L-arginine, one of the essential amino acids, plays an important role in keeping the body in healthy condition. Its functions include: converting ammonia to urea that is then excreted as waste; acting as a vasodilator; and promoting the release of several key hormones. Beet is rich in water-soluble plant fiber that regulates enterobacteria, and is also high in prebiotics that help to alleviate a variety of chronic diseases. Arginine is a type of non-essential amino acid that was discovered in 1986 in the shoots of the legume known as lupines. Arginine promotes growth hormone secretion, strengthens muscle tissue, boosts immune response and can even detoxify ammonia. The body is capable of synthesizing arginine but not in sufficient quantity, which is why supplementation is required. For this reason, arginine is sometimes referred to as a semi-essential amino acid. Growth hormones secreted from the pituitary gland promote resistance to disease and help the body to recover more rapidly from trauma. Arginine stimulates the immunocytes known as macrophage. These are the white blood cells that fight bacteria and viruses in the body. Improved immunity helps the body to resist disease and stay healthy. Arginine is part of the ornithine cycle for metabolism of ammonia in the liver, with responsibility for detoxifying the ammonia. The ornithine cycle complements the citric acid cycle, which produces energy. Detoxification of ammonia normalizes the liver function. Arginine produces nitrogen monoxide within the body. Nitrogen monoxide promotes systemic (general) circulation and renal circulation and helps regulate blood pressure. By dilating the blood vessels to promote general blood flow, nitrogen monoxide helps to prevent hardening of arteries that can lead to a heart attack or stroke. Arginine helps to improve moisture retention in the skin. The skin consists of three layers: stratum corneum, epidermis and dermis. Dry skin indicates a lack of moisture in the stratum corneum. Natural Moisturizing Factor (NMF) substances that add moisture to the skin contain around 40% amino acids. Thus arginine helps to moisturize the stratum corneum. Amino acids are classified into L and D types. 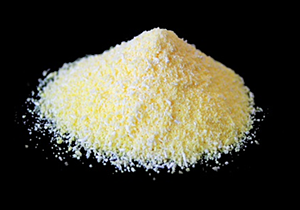 D-arginine is not absorbed into the body and is mostly excreted. L-arginine is readily absorbed into the body. Reddish-purple beet is a member of the amaranth family, along with spinach and grasses. Note that it is not related to beetroot and radish. Beet is most commonly known as the principal ingredient in the Russian soup borscht. In Japan it is called the “miracle vegetable” on account of its striking color. One of the key beneficial components in beet is nitrogen monoxide (NO). Nitrogen monoxide promotes blood flow as well as muscle function of around the capillaries, thereby helping to prevent blot clots that can trigger strokes and heart disease. Nitrogen monoxide also boosts blood volume so that oxygen can be transported around the body more efficiently. This has the effect of speeding up recovery from fatigue. Betaine enhances the functioning of the liver and wards off fat, thereby helping to prevent problems such as cirrhosis and fatty liver. Beet contains natural oligosaccharides and dietary fiber that boost probiotic (“good”) bacteria in the intestines while suppressing bad bacteria. They also work to discharge waste matter and cholesterol from the body. 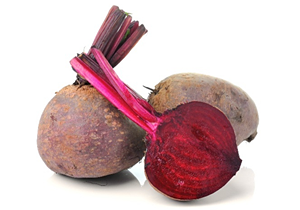 Betacyanin, the red pigment in beet, is a powerful antioxidant that helps to prevent cancer.